Kawasan Falls is among the popular summer destinations that Cebuano heads to when the heat becomes unbearable. This waterfalls system is blessed with numerous cascades and pools of chilly water and a dip in any of its falls is refreshing. This famous waterfall in Cebu belongs to Badian, the town, and Matutinao – the barangay. Getting here is easy even for first time tourists but the bus ride is long but worth it. If you want nature and cool waters, make your way to Kawasan! Go, go, goooo! In Cebu South Bus Terminal or SBT, you can ride any bus that goes to “Bato via Barili”, the other route would be “Bato via Liloan, Oslob”. There are Ceres liner buses for this but aircon buses are rare going to this part of the province. Please note that Oslob is on the other side of the island, there is a mountain range in the middle of South Cebu dividing the south-east side and the south-west side. Kawasan is on the south-west side. The road division will come at Carcar rotunda. If you will stop by Carcar, instead of riding Ceres Liners, you should ride the mini-buses bound for Carcar, you can also find them inside the terminal of the Cebu South Bus. Bus ride from Cebu SBT to Carcar will take 1 hour, fare is P40. If you go straight to Kawasan in the Municipality of Badian, ride buses bound for “Badian” or those going to “Bato via Barili” the fare will be P126. SBT to Kawasan is around 3 hours and 30 minutes. If traffic is not heavy you can make it in 3 hours. Don’t know how to go to South Bus Terminal from Mactan Airport? You can read this commuting guide – Cebu airport to SBT via jeepney. If you are like us who got off in Carcar to buy our lunch supplies and drinks, be ready to stand in the middle of the bus. This is because most of the buses with route “Bato via Barili” will be full by the time they get to Carcar. You may be looking at standing in the middle of the bus for the next 2 and a half hours ride. I’m not kidding coz we experienced it. Lol. I, Doi and Kenneth were standing from Carcar until we get to the lone bus stop in Barili proper, almost an hour into the second leg of our trip, whereas the guys were only able to sit down when a big family who were obviously excursionist got off in La Playa Beach Resort in Badian. Titus and Vince stood up on the bus for more than 2 hours and were able to sit down for approximately 2 minutes before we have to get off the bus at the corner to Kawasan heheheh. You should see their grins when they got off the bus hehehe. What makes it tough to stand on the bus aisle is that you can’t believe how winding the road climbing to the town of Barili. If you are not seated, expect sore arm and leg muscles when you get off, even if you are seated you will still feel the brunt of the long winding road. Really. As in! I am used to taking long bus rides from all trips I’ve taken in our country but still I have to brace myself every time I see a sharp blind curve approaching. I was even thinking that the winding road will make me dizzy and vomit, thank goodness it did not happen. Is the ride worth it? Very much. When you are cruising through the mountain, the view gets more amazing – beautiful mountain curves and open seas. On a clear day you can even glimpse far away Negros Oriental and of course your ultimate reward is taking a dip in the cold waters of Kawasan. Fare from Carcar to Matutinao, Kawasan Falls is part of Barangay Matutinao, is P78 per person. As you trek to the main falls, you will be sweating a lot especially if you get there at the bus stop at midday =) Some like us prefers the Day Trip for this summer destination in Cebu, while others who have more time and funds go for Overnight Stay at one of the cottages. The road from second to third is the steepest and most slippery so you must be cautious if you decide to go there. If you don’t have anyone who’s been to the 3rd falls, there is a chance of getting lost. Only a few tourist ventures as far as the third falls, but this falls of Kawasan is one of the more friendly for swimming and best for picture taking. Kids can take it, when we checked out the third falls lots of kids were there. The third falls is also the designated camping ground, there were 3 tents on the area when we went there. So where are you going this summer? is there any bus from kawasan falls to oslob? our plan is to climb osmena peak traverse to kawasan falls then to oslob? 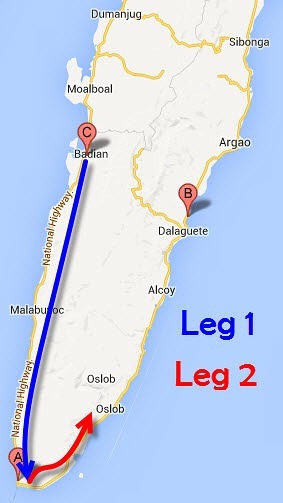 are the jeeps available up to 9 or 10pm from bato to oslob? sorry, no idea about that. anyway thank you for the info. Hello I love your post, It helped alot. Just a quick views, what is your thought for solo female traveler to go to Kawasan Falls and Oslob Whale Sharks watching on different date alone from Mao lboal? I am planning to go this July end. Hi Dina, I have lots of solo travelers friends (men and women) who have explored the nooks of Cebu north and south and had a great time. 🙂 But as you know, though Cebu is peaceful especially the provincial towns, it pays to always keep your wits about you when traveling solo, this rings true anywhere in the world you maybe exploring. hi may i ask if its optional to rent cottage? they have a locker to put our things? Hi Pat, walang locker dun sa kawasan area. Yung cottage optional lang naman.